To become an online entrepreneur is not as difficult as many would have you believe that it is ! In fact, I want to help you by helping you understand how to become and online entrepreneur and explaining what I have come to learn and used to create and grow my six figure business ! The first of many steps is likely the most difficult and that essential step is to start! Talking and thinking about it will not get you one step closer to success ! I have a saying that I like to make sure all my students understand fully! That is, the word someday will do nothing for your success! In fact the word someday will make sure that all of your hopes and dreams go to the grave with you! You have one life! That’s all! Use it and optimize it to create something you are proud of and can live the life you want with ! What Exactly Does It Mean to Be An Online Entrepreneur? That is a very good question ! And there are many answers that can be correct when considering what it means to be an online entrepreneur. The term “entrepreneur” is used so much online these days that it would seem everyone is an entrepreneur! From the lady who just started a blog about her knitting to the guy selling baseball cards on EBay, everyone likes to throw the term around and bask in the glory of the success it seems to indicate! The true fact in my world is that I’m not overly concerned with the true meaning of being an online or internet entrepreneur ! My biggest goals are not the same as many other people’s goals. In fact your goals may be far more lofty than mine and that is absolutely great! If you want to be a part of the “Laptops and Lamborghini” crowd I really hope you achieve your goal! The goal is attainable so go after it! My goals were somewhat less lofty, and much easier and faster to achieve! You see I am not a person who considers success and entrepreneurship as a certain thing. My personal definition of entrepreneur is that I and my family are happy, financially free and I can do that, doing something I love, while doing it on my terms and from anywhere in the world I want to do it as longs as I have an internet connection! I didn’t get started online so that I could earn money without physical work involved ! I got started online because I wanted to be free! I wanted freedom of time and finances, while not being tied down and married to my 9 to 5 jobs that I spent so many years plugging away at! What Does It Take To Become An Online Entrepreneur? You may be surprised to learn that many online entrepreneurs are just run-of-the-mill average people who came across an opportunity and learned as much as they could about it! I am just an average guy! I’m the average guy who will likely have grease stains embedded in my pores for the rest of my life because I had been a maintenance technician for many years ! I started out just like many people start! I was born and raised in a household that was a multi generational poverty wheel so to speak! There were no educated people in my family and everyone worked the long hours and low pay of the rat race to put food on the table and try to make ends meet! My mother left my chemically dependent dad when I was 3 years old and started on her journey of 2 jobs to raise two kids with little education or skills ! There were many tough times, but my mom instilled the fight and never give up attitude in me that would be one of my most valuable assets. The other was gratitude! Being grateful for what you have and where you are is so extremely important in anything you do ! I started in online business as an affiliate marketer and learn a ton of new things fairly quickly! My focus online is still affiliate marketing but I have branched out a bit and gotten into other areas and income streams as well! Everything I learned and continue to learn came from a training and mentorship program that also has an awesome live community of thousands and thousands of people that were either newbies like me, on the road to learning or massively successful affiliate marketers ! It is awesome to have someone to support you and help you out along the way! But when you have access to millionaires as well as newbies it makes the road far less bumpy! If you would like to learn about how you can access the exact same system I used and sign up for a free account you can learn how to get started here . The list of answers to the question of what does it take to become an online entrepreneur is a simple and short one ! How Much Time Does It Take To Become An Online Entrepreneur? This is usually one of the first 2 or 3 questions everyone asks when they are considering a lifestyle of earning passive income on the internet, and it’s a good one ! Most people have the idea that you can create a get-rich-quick income stream on the internet overnight! That isn’t true! I don’t blame people for thinking this, but I always tell everyone the truth that it will take some time and patience! There are no really successful businesses that make six or seven figures built overnight !It doesn’t happen this side short of the lottery! It takes time to learn to earn online and do it the right way. There are people online who claim to have a secret system or study course that they can sell you and explain to you how to start making big bucks the very first day! That is a lie and anyone trying to tell you that is trying to scam you out of your money! If you are anything like me, you will have to learn everything as you go! That takes time ! The best thing about using a great system like Wealthy Affiliate is that you will be building as you learn so it takes far less time and less chance of failure ! But it will still take time! You have to go into it with a mindset that says that you will stick with it and do the grunting and grinding until you start seeing results. If you have that mentality, you could very well be one of those people who fall into the category of online entrepreneur! If you don’t have that mindset, you will fail before you get started good and to be honest, earning money online is not for you. Just think about it like you would any business, with the exception that you don’t have to spend a lot of money up front! As Pat Flynn at Smart Passive Income states, you put in the work now so that you can sit back and reap the benefits later! For my story and help getting started the right way …..
Only You Can Supply The Effort! Even with the best online training in the world and the dedication of time, you have to put in the effort, and the effort is completely up to you! The more effort and time you invest into earning money online, the faster you will make progress and the faster you will achieve your goals! A good case in point can be found in my first couple of months online versus a friend and fellow member of the same training system I used to get started online! When I started I followed the training religiously and went to work on my first endeavor which was building a niche website for affiliate marketing. My friend Mark started 4 days after I did and was likewise very motivated. The big difference was the effort we supplied ! While Mark was on his website and training every day working to improve his efforts, I became interested in learning as much as possible as I went so I started watching YouTube videos on how to subjects surrounding my website and affiliate marketing. My goal wasn’t to change things up, it was to learn as much as possible as fast as possible and super size my efforts. But what I was doing was actually not using my time wisely and falling behind! After about 3 months Mark’s website was doing great and starting to see some big gains in traffic, and mine was floundering with half the amount of content because I had been learning and watching videos while Mark was following the training and putting in the effort! When I became aware of the success Mark was having, I stopped everything but the training program and working on my content! My efforts paid off and my traffic and income started to turn the corner! It is worth noting that I have build a couple of websites and worked on other streams of income that have become very profitable thanks to the awesome training and mentoring I received. But Mark is still ahead of me in the number of income streams and profit, because I wasted so much time ! Do one thing at a time and put the best effort into it! Don’t go for what is known as shiny object syndrome and do three or four things at once ! All it will do is deter you from your goals and staying focused! It is difficult to be a specialist when implementing the practices in this list! Every one of the 5 points is super important, but patience is perhaps the most important! There will be some time when you first get started in any online venture where you will see nothing happening. Don’t freak out because it’s normal! Every person who has ever started any sort of business online has gone through the same thing, and if they say otherwise they are most likely lying to you! Everything online is based on information and helping other people. That is done by answering questions and helping with your blog, YouTube channel, Ecommerce products or any of the other ways you can make money online! That is why the internet has long since been known as the information super highway! You don’t just jump online and start cashing checks. You will have to build and create your business! It sounds difficult but it isn’t when you have training and mentoring. The hardest parts of online business is simply the time, effort and patience that you must invest to grow your business and therefore your income. If you remain patient and keep on working on it, you will be building what will earn you money! I call this the “work your face off-stage”. By keeping your head down and “working your face off” you won’t realize what is starting to happen when your efforts start paying off! Then when you do start seeing the increase in results, it will start quickly and build momentum really fast! If you would like to learn more about the exact system I used and told you about, click here to learn how to get started on your way with passive income online with a FREE MEMBERSHIP! There is no E mail sign up required for this information! It requires absolutely no experience to get started online, and no specialized education! If you posses a middle school reading and writing ability when you start, you can achieve some truly amazing things if you keep the time, effort and patience mindset! There are certain things that you will need to learn along the way, like autoresponders and sales funnels that may sound completely vague and unknown to you now. But with the right training you can get started and learn everything you need! You should have a willingness to learn everything you possibly can, and then take action on what you learn! Learning does nothing for you but make you smarter if you don’t put it to work for you! I love to read and books have become a big part of my life ! I have read books on affiliate marketing to investing and everything in between! Two of my favorites are Laptop Millionaire by Mark Anastasi and The Four Hour Work Week by Timmothy Ferris and I have linked those books so that you can download them for free and listen to the on Audible.com! I love to read, but when I am very busy or traveling, I love to listen to these books on Audible! Not to mention that listening is much easier than looking at several hundred pages of text! 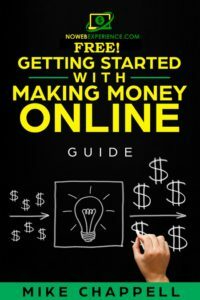 I strongly recommend that you read and learn everything you can within the online business world as well as the niche or category you decide to get into online! Whether it’s a blog post, YouTube Video or simple graphics for Facebook,Instagram and SnapChat or maybe a pin for Pinterest! Whichever types of social media you decide on treat them as part of your business, because in fact it will be from promoting your blog or website to using social media ads to promote your business, it all counts and is an important part of your online business! Once you have gotten started and have your efforts going, I would strongly suggest that you use your story and what you do to create a simple E book! To get started with Email marketing you will need a piece of content that you can give away in return for an Email address. A simple E book written in your own words about where you come from and how you got started will be a great option for the give away! It may sound daunting right now, but you will soon see that it is in your best interest and may be the most important aspect of your business ! Create something that can offer advice or help for others, and do it often! You will be amazed when the time comes that you have learned enough to create a video list of helpful hints of how to do exactly what you are doing and sell them as a how to course ! It will happen! You might be thinking that you have no clue how to do that right now, but it will blow your mind how fast you will learn and be able to pass that knowledge along to people who have the same questions you had when you started! It really doesn’t matter what your idea of being an entrepreneur is, and it doesn’t matter if it matches someone else’s idea of what an entrepreneur is ! The fact that one person was successful means that tens of thousands of people can do it too! The fact that tens of thousands of people have become successful and became entrepreneurs online means that you can too! You simply have to do it and maintain the proper mindset along the way! I would like to sincerely thank you for taking time to read my article! If you have comments, questions or suggestions I would really appreciate it if you left them in the comments section below! Your feedback greatly helps me to better serve my readers ! Please allow me to leave you with a question. Previous Post:Is VidRepurposer A Scam: Or Maximize Content Creation! Next Post:Aweber Review-Best E-Mail List Building Tool! Hi, this sounds quite easy to start being an online entrepreneur and still there seem to be quite a lot of skills involved. I have started, the first step is done 🙂 now I’m in my second year and still learn a lot every day. I work with Wealthy Affiliate, you’re right, this is the place to start this journey. I write my blog and it’s a lot of fun although not always easy. Right now I am researching a product I want to write about, a very complex product. It can take many hours to really know what to write so that it is the truth or at least a qualified review. Thanks for your comment and feedback Stefan! This is an inspirational website because it offers so much wisdom and an essential guide to becoming financially free. It is down to earth, does not offer rewards without work, and is not some push-button scam seen in so many other areas. You have to stick with your goals, work a little every day (or a lot! ), and so the work needed to achieve success. Learning to be a successful entrepreneur is like learning any other skill; it takes time and effort to become successful. I am often amused by those who seem to think there is some “magic” or “secret” formula to achieving any form of business success. If that were the case, everybody would be driving Mercedes! It takes time to learn the skill set needed to achieve anything worthwhile – and this is no exception. But there is an ordered way to go about this work and you have well laid it all out on this site. You point people int he right direction to learn how to achieve their dreams. Good Job! Thank you so much for your kind words and your feedback Dave ! If you ever need a hand or need a question answered, I would be honored to help sir! Just let me know! The very best of success to you Dave ! As a beginner blogger who wants to succeed as an online entrepreneur I found your article to be very informative. A one stop shop if I may. If I can implement and incorporate half of the concepts and resources, I know I will grow in leaps and bounds. Your article was like a neon sign shinning brightly pointing me in the right direction. Thank you for the insight and direction! Thank you very much for your comment and very kind words Diane! Hi Mike, your post is refreshingly honest and I enjoyed reading it very much. I too am an affiliate marketer. When I started I really didn’t have much background, it just seemed like a cool thing to do and I’d hoped it would be easy and that it would make me some money fairly quickly. I was so wrong! I soon realised that I had to put a lot of work in, that I had to write quality content (and lots of it!) and that I wouldn’t make money overnight. I wish I’d found a blog like this back then that paints a more realistic picture. Fast forward a year and I LOVE affiliate marketing, I can’t get enough of it, and I am making money. More to the point, I have built a website I am immensely proud of that is beginning to get traffic and traction. I’m not making 6 figures from my site yet, but I know that in time I will. The foundation is there, and my site is growing every week. The projections are all moving in the right direction! I’m so happy for you that you’ve reached your goals and are making the income that you want, and that you’re your own boss! Awesome. Thanks for your comment Melissa ! I’m glad to hear that your efforts in affiliate marketing are going well! Affiliate marketing is my favorite platform for online business as well! I like your definition of what is an entrepreneur. Be happy with what you are doing, it makes you financially free, you work on your own terms and you can work where ever you chose as long as you have a internet connection. I have worked many years in tourism and it often would get very hectic with a lot of running around. I visited many beautiful places but am happy my life is a bit more quiet. Now I have created 2 websites, it was sometimes frustrating as I am not technical but now I am proud I did not give up. I will continue on this chosen road and the money will come one day. For the moment I find it important I have the possibility to spread the news and I have the hope it will also help people reading my posts. You are right, it needs patience and being focused, I am doing my best. Hats off to your Mother, she was a fighter. Thank you for your kind words Taetske! Keep up the awesome work and never give up! It sounds like you are headed the right way! Hi Mike, I am a new website owner trying to be financially free and an online entrepreneur. It is very inspirational and I know that although it sounds easy, dedication is required to be successful. I have pick up a few things just by reading your post. I hope I can use it to my best advantage and will be waiting for more articles from you. Thank you. Thanks for your comment and feedback! I really appreciate that! My best advice for you as a beginner is to stay motivated and never give up! You will see quite a bit of time pass when you start and have little or no success, but it’s that way for everyone, and it’s normal. During the slow time continue to put as much effort as possible in and build , build build! If you follow that game plan you WILL be successful ! Like you, I too am learning to succeed as an online entrepreneur. You offer some very solid advice here and something you said reminded me of what I need to do. READ. A radio personality that I listen to regularly often says to READ. No, not romance novels or magazines, but books that are about the goals you wish to achieve or biographies of people who have made it to where you hope to be. I fall asleep when reading so I think your audible idea is a really sound one (see what I did there!). I tend to read books about money. Not spending it. Not earning it, but keeping what little I’ve got and doing the right thing with it. Today, as I turn the page to a new chapter in my life, the pursuit of online entrepreneurship I am going to take your advice and READ in the moments that I cannot be in front of a computer screen chasing this dream of mine. You article has motivated me to act. Not just focus more on my own website, but to do things for my business that are also not online. Looking at the comments on this article, I can say that you know you’ve done a good article when your readers are taking away different but solid ideas from reading it. Thanks so much for your comment and kind words ! I really appreciate it!